The consumer demands for a successful person-to-person (P2P) platform are extreme: easy, immediate, and free. For comparison, Visa debit transactions settle, through a Fed1031 drawdown from the receiver of funds and a Fed 1032 response transferring value to honor the 1031 request, next-day at best at a Durbin-regulated rate of ~25 cents/transaction. Wire-transfers, which have traditionally provided the only real-time settlement option for inter-bank transactions, are cost-prohibitive for mass P2P adoption. Distributed consensus technologies, such as the Bitcoin blockchain, provide an immediate and low-cost solution but there are regulatory concerns not least around KYC (although we think Santander’s investment in Ripple, announced October, will prove far-sighted). Furthermore, banks have no direct business case for meeting these demands given potential cannibalization of the wire-transfer business and likely threat to DDA-balances as consumer frictions to rate-hopping are reduced. Unsurprisingly, banks have under-invested in P2P infrastructure so that most solutions access DDA-accounts through the ACH system (used to process check transactions) but ACH does not support real-time clearance or even funds-verification. This has held back the development of the P2P market as providers must either wait to offer funds to recipients (until ACH settles which is next-day at the earliest and, in practice, after 3 business days) or offer “good-funds” earlier by bearing the risk of transaction failure just as a retailer accepting a check. Processors such as FIS and FISV can do better (through their People Pay and Pop Money services) given DDA-access on some transactions through direct connections to the core processing platforms of client banks and through ownership of the electronic funds transfer or EFT networks (used for ATM and some PIN-enabled POS transactions) that support real-time clearance and funds-verification. And some P2P services, such as PayPal/Venmo, Square Cash, Google Wallet, and Facebook, access DDAs through the Visa/MasterCard networks which support real-time funds-verification (albeit not clearance for the “dual-message” systems) but are expensive even after the Durbin cap on debit interchange. However, the value of payments information for targeted marketing to smartphone-carrying consumers has changed the bank perspective since the central point of P2P is a directory associating a DDA account with the personally-identifying information or PII of a consumer such as an e-mail address or message-handle. The recognition by large banks of the value of this directory, even if it means supporting quick and free P2P (which, in any event, is a relatively small market estimated at $5.2bn in 2014 versus $2tn for US card payments) is reflected in the recent strengthening of the bank-owned P2P utility, clearXchange or CX: through combination, announced on October 26th, with Early Warning Systems or EWS (the leading bank risk and fraud utility which, with the April acquisition of Authentify, added capabilities in phone-based authentication); through the addition of USB and PNC as owners along with current owners JPM, BAC, WFC, and COF (so that, along with EWS, CX now has access to over 70% of DDAs in the US); and through working with third parties (with the WSJ reporting on 11-16 that CX was in discussions with Apple). The advantage of CX is that it deploys a directory-model for funds-settlement by book-transfer, which can be real-time, rather than settling, with a multiple-day delay, through the Federal Reserve system; in a P2P context, it is an extension of the ON-US model where sender and receiver hold accounts at the same bank (so obviating the need to settle through an external network) to an ON-WE model where sender and receiver hold accounts at banks on the same CX directory. Furthermore, we expect this directory to be extended from the current access to 70%+ of US DDA accounts (provided by owner-members JPM, WFC, BAC, COF, BBT, USB, and PNC along with EWS clients) to the near-comprehensive coverage of ACH through interoperability with the P2P networks of FIS and FISV (People Pay and Pop Money respectively) which leverage DDA-access via: (i) connectivity to the core processing platforms of client-banks, typically regional banks and credit unions; and (ii) ownership of electronic funds transfer or EFT networks used to process ATM and PIN-authenticated point-of-sale or POS debit transactions. Having established a payments brand in the P2P segment, we see no reason that CX cannot extend its franchise to point-of-sale and challenge Visa and MasterCard. A payment to the micro-merchants such as those serviced by Square is, after all, similar to a P2P payment. For larger merchants, CX will enable member-banks to follow in the footsteps of JPM in escaping the Visa rule set and, as CEO Jamie Dimon put it in February 2013 when announcing ChaseNet “go to merchant and strike our own deals”. 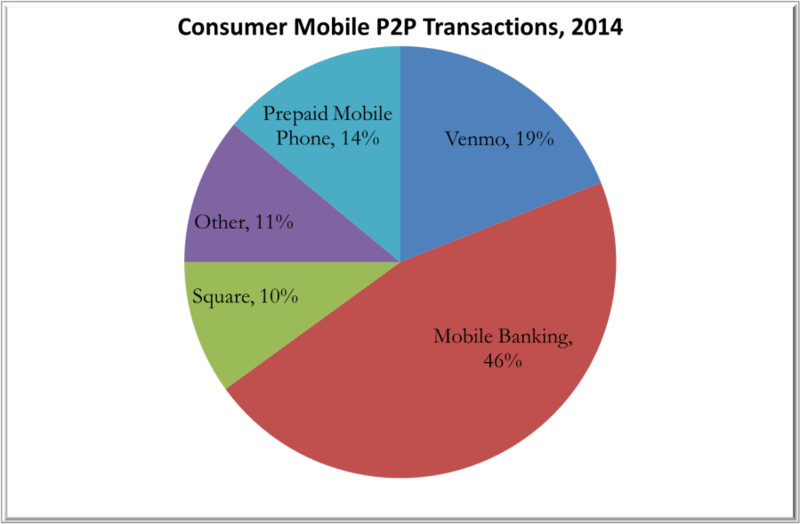 PYPL, which through Venmo has ~20% share of the mobile person-to-person or P2P payments market (Chart 1), may face new competition given news (WSJ – 11/16) that Apple is in discussions with banks to complement Apple Pay with a P2P capability. 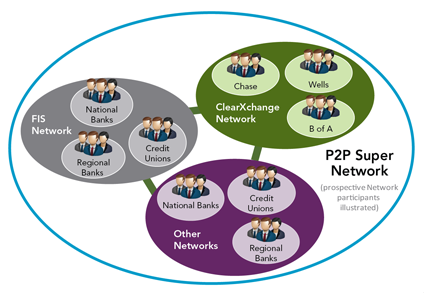 At the same time, the bank-owned utility referred to as clearXchange (CX) which enables P2P for large banks (including BAC, Chase, WFC, COF, USB, and PNC) announced on October 26th that it would be acquired by another bank-owned utility, Early Warning Systems (EWS), which specializes in risk management including, through its April purchase of Authentify, phone-based authentication (which, in brief, involves identifying an individual including through biometrics such as TouchID and then verifying that the individual is a legitimate use of a phone and authorized user of any linked payment account). There is a lot going under the hood, and this note looks to unpack it. Facebook: In March FB, after hiring previous PYPL CEO David Marcus, announced its Messenger app would support P2P payments, once a user adds a debit card to a Facebook account, with product manager Steve Davis adding “we are not building a payments business … payments in Messenger is focused on providing utility”. CurrentC: The CurrentC pay-and-save mobile app from the retailer payments consortium MCX (whose members account for over one-quarter of retail spending in the US) is driven by as much by customer-relationship considerations as the potential to reduce card-acceptance costs. MCX member, Dunkin Donuts, has commented that “we wanted to protect and control our own data” and the Target RED debit card is illustrative: given the 5% discount, TGT pays consumers $2 on an average ticket of $40 which is substantially more than on a network-branded debit card given the Durbin cap on debit interchange for regulated banks of ~25 cents/transaction. Apple: Apple Pay adoption has disappointed to date because beating the card-swipe requires a consumer benefit beyond the novelty “delight” of tap ‘n’ pay: consumers do not clip coupons because it streamlines the checkout process but because it saves them money, and CurrentC is in a better position than Apple Pay to deliver these savings (given, for example, its retailer-backing and partnership with coupon-manager Inmar). Indeed, the number of eligible Apple Pay users who tried the service declined to 13% in June from 15% in March. This lackluster adoption is a stark contrast to CEO Tim Cook’s remark on the potential of digital payments that “your kids will not know what cash is,” and Apple has now identified that consumers may be more frustrated at existing technology for sending money to each other than paying at point-of-sale. Excluding distributed consensus systems such as the Bitcoin blockchain, the only general option for real-time settlement of a P2P transaction is a wire transfer. This is because settlement involves exchange of value between the banks representing payer/sender and payee/receiver, and requires updating these banks’ accounts at the Federal Reserve. In the specific case where sender and receiver have accounts at the same bank, a real-time transaction is possible because the administering bank can settle funds via an “ON-US” book transfer without processing through a network. The ACH system provides the most general solution for P2P transfers because, in support of its core check-processing function, it can access the DDAs of all US banks. 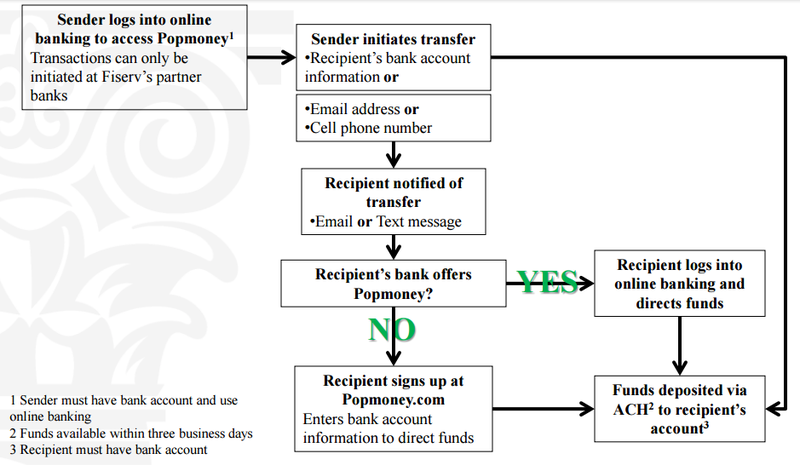 However, as illustrated below for the PopMoney service offered by FISV (Chart 1), ACH-routed funds may not be available to the recipient for up to three business days. This delay arises because P2P transactions are processed as ACH debits (like automatic deductions for insurance premiums, for example) rather than as ACH credits (like payroll direct deposit, for example) which are settled finally and irrevocably after two-days. The situation is further confused by ACH’s representation as offering “next day” settlement for ACH debit; in practice, it does not because of the possibility of transactions that are refused or “returned”. The ACH-debit specifics are that the receiving depositary financial institution or RDFI (which will be the payer’s bank in the case of a P2P transaction) has until the end of the day following its receipt of an ACH-debit request to indicate to the Federal Reserve that it wants to return the transaction (because, for example, of an invalid account number, non-sufficient funds or NSF, or a stop-payment request). If the RDFI makes no indication, the transaction settles but the originating depositary financial institution or ODFI (which will be the payee’s bank in the case of a P2P transaction) receives no confirmation; the only response received in an ACH debit by an ODFI is notification of a return and this can take three business days. ODFI’s are therefore reluctant to provide value to their payee customers within this window. All that said, the rule-making body for the ACH system, NACHA, has announced rules that would support same-day settlement for ACH debits and The Clearing House, which owns the ACH system, has partnered with UK-based VocaLink to develop the technology for a real-time payments system in the US. However, ACH is not the only settlement option for P2P transactions. Where the payer has a sufficient balance, PYPL can offer good-funds to the payee more quickly because its “viral” business model is based on administering the accounts of both payer and payee. 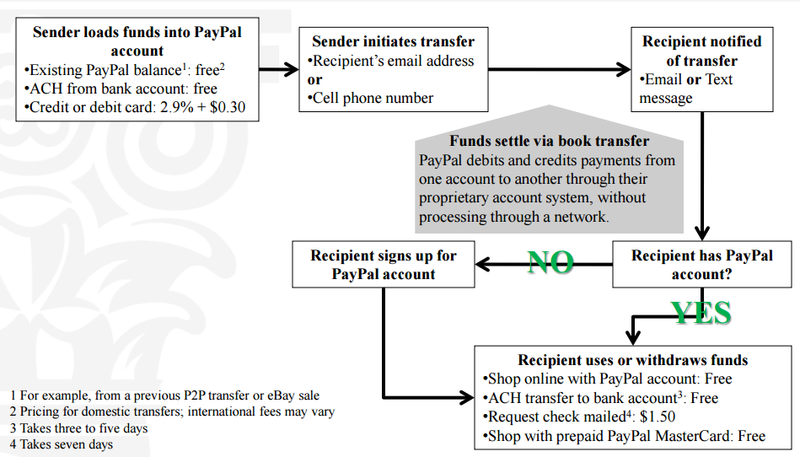 This means that, as in the case of an ON-US bank transaction, funds are settled by book transfer on PayPal’s proprietary accounting system without processing through a network. However, if the payee wants to transfer funds to a bank account, rather than using them to shop, ACH delays kick in again (Chart 2). The processors, so FIS and FISV, can improve also upon a native ACH transaction by leveraging the DDA-access they enjoy through direct connection to the core processing platforms of their bank clients and through ownership of electronic funds transfer or EFT networks that process ATM and some PIN-authenticated POS debit transactions and, unlike ACH, support real-time funds-verification and clearance. It is important to note that there is no network that supports real-time settlement since this involves the updating of bank accounts held at the Federal Reserve which, except in the case of a wire transfer, is not a real-time process. However, the EFT networks support real-time clearance which is the non-monetary exchange of transaction information (as opposed to settlement which is exchange of value). In “good-funds” P2P models, the bank representing the payee will honor the commitment expressed by the bank representing the payer in this clearing information and make “good funds” available to the payee before inter-bank settlement of the transaction and hence take settlement risk (i.e. the risk that a cleared transaction does not finally settle) in just the same way, in the case of an ACH debit, that a retailer accepting a check takes settlement risk. FIS comments on this ability to improve on a native ACH-routing as follows: “there are a number of ways we can make a transaction happen in real time from our core integration that we do through the PayNet infrastructure, through our [electronic funds transfer or EFT] rails or through kind of a real-time [automated clearing house or ACH] methodology”. In practice, this means that where both bank counterparties (i.e. the banks administering the sender and receiver accounts) offer People Pay, FIS routes across its direct connection with core systems for a “PayNet” transaction settling in real time (since settlement amounts to a book transfer across the PayNet accounting system with no processing over a third-party network). Where one or both the banks does not offer People Pay but is a member of FIS’ EFT network, NYCE, then real-time “good funds” is still possible even though the intermediation by a third-party network means that real-time settlement is not. For example, in the case where the EFT bank represents the sender, FIS can verify funds-availability in real-time and real-time clearance information allows the sender’s bank to put a hold on that portion of the balance supporting the transfer; the result is that the settlement risk to the counterparty bank of making good funds available to the receivers is meaningfully lower than in a native ACH transaction. Finally, the bank P2P utility, clearXchange (CX), offers a broader approach to replacing ACH transactions than even the processors because, its owner-members when combined with the reach of Early Warning Systems (EWS), have access to over 70% of DDA accounts in the US. CEO Mike Kennedy has commented that CX can offer a better real-time payments service than ACH, even when it implements “same-day” settlement, because “they have different windows within their solutions when transactions have to be submitted by to even be done in the same day whereas we are looking at a 24/7 solution”. While CX has not submitted details of its implementation, we infer from this remark that it will maintain a central directory of all DDA accounts, along with associated PII, and effect funds-settlement among member-banks not via that batch-processing of ACH but in real-time via book-transfer on this directory. One way to think of this approach is as an extension of ON-US settlement where sender and receiver hold accounts at the same bank to ON-WE settlement where sender and receiver hold accounts at banks on the same directory (in this case maintained by CX but, in the case of PayNet as a second example, maintained by FIS). The challenge for CX, of course, is that access to over 70% of DDA accounts is not the comprehensive access enjoyed by ACH. Given the owner-member of CX include most of the top banks (JPM, BAC, WFC, COF, BBT, USB and PNC) most of the gap, aside from C and STI, includes regional banks and credit unions and these tend to be served by the processors (although there is some overlap is USB, aside from announcing its membership of CX in October, uses FISV’s Pop Money service). While CX does have some smaller members such as First Bank and can access over 2,000 more through the combination with EWS, approaching the comprehensive coverage of ACH will likely require interoperability with the P2P networks provided by FIS and FISV. Both processors have indicated their interest in this network-of-networks arrangement (Chart 3).